Issued in De Agostini Porsche series. Porsche boxster (986) yellow - opening doors. Unknown manufaturer. Baseplate reads no. 1098. Homann Porsche Boxster (prototype) Model commissioned by the Porsche Modell Club for the 1st swapmeet. Model has decal on the back. please note; little tab on the clear plastic box is broken off. This holds the clear plastic part to the blue baseplate. Malibu 00100 Porsche Boxster (986) open (black) 1/87 scale - diecast. 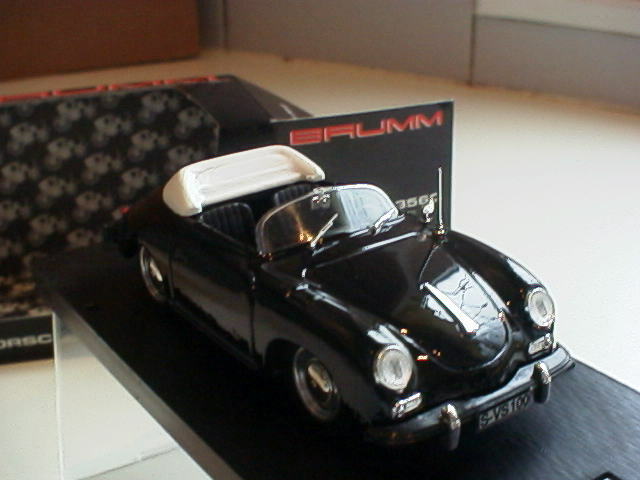 Automaxx Porsche Boxster (986) Black 1/87 scale. Diecast. Real-X Porsche boxster S (986) hardtop (red). Diecast in 1/72 scale. Issued in the Porsche collection. Made in Japan. 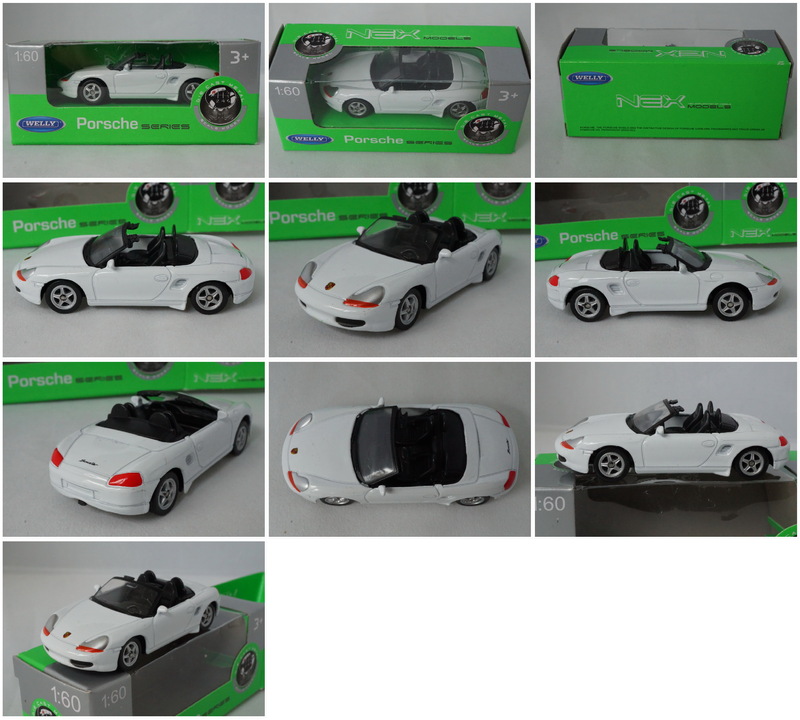 Majorette Porsche boxster (prototype) in approx 1/57 scale..
Sternquell Porsche Boxster (986). Special 2006 issue by German brewery. 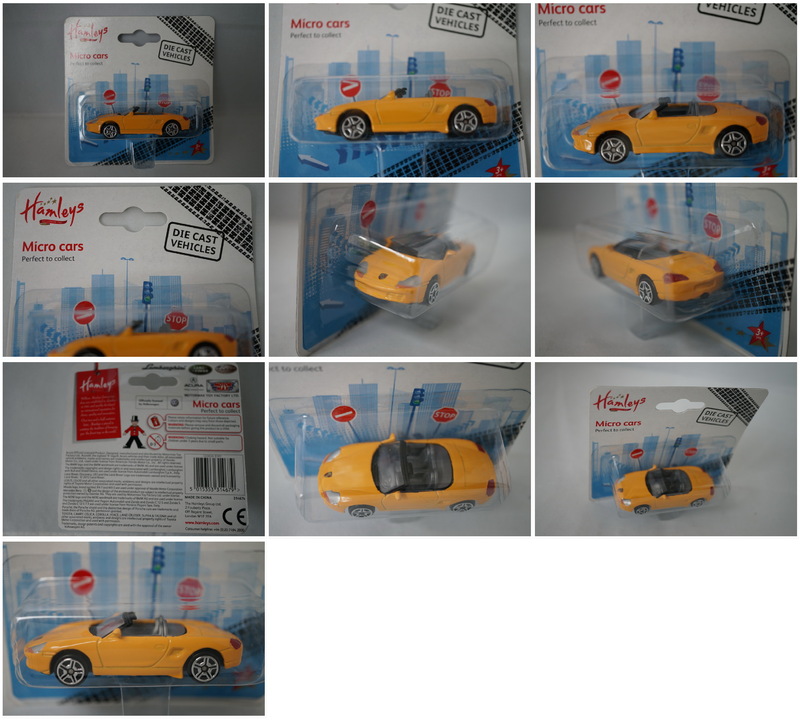 Siku #0849 Porsche Boxster (986) Red 1/57 scale. 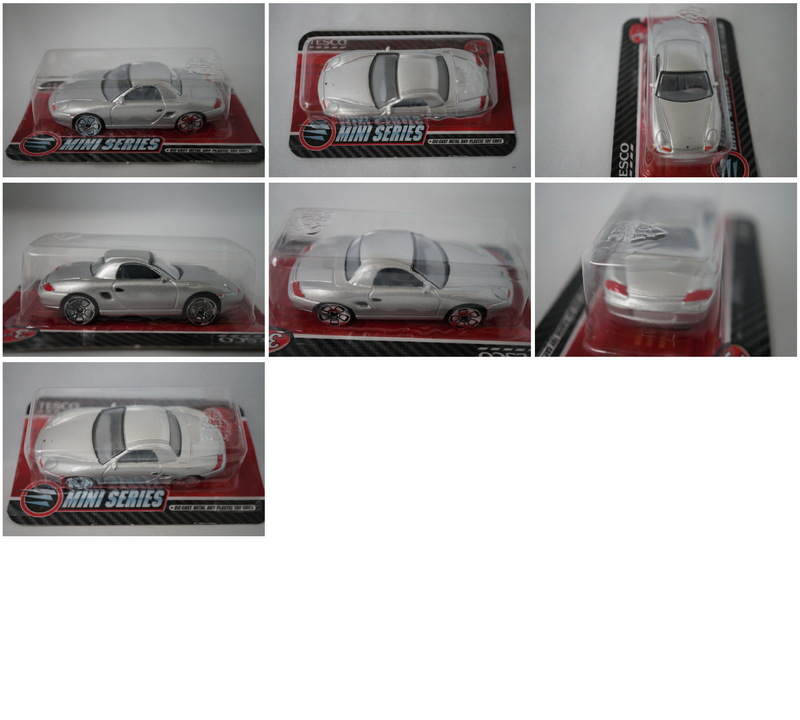 Tomy #91 Porsche Boxster (986) Silver 1/57 scale. Schuco 253090 Porsche Cayman S Highway patrol (black) 1/87 scale - diecast. Guentex (Welly) Porsche Cayenne & Porsche 911 (996) on trailer. Diecast model in approx 1/38 sclae. .
Eagle's Race Porsche 911 2,4-LS 1973 (Metallic Green). Model has Fuchs wheels. Vitesse L012 Porsche 911R 1967 (orange/red). Heritage Classics 016 Porsche 911 1964 silver. Model is made by Vitesse and issued under the Heritage Classics label. Heritage Classics L042 Porsche 911R 1969 Tour de France #181 (white). Model is made by Vitesse and issued under the Heritage Classics label. Fabri Editori Porsche 911 S 2.4 - 1972 (white) - Opening doors, bonnet, rear. Burago 3060 Porsche 911 Carrera 1993. Issued in the Die-cast metal 1:18 Diamonds series. Older issue (90's). Made in Italy. 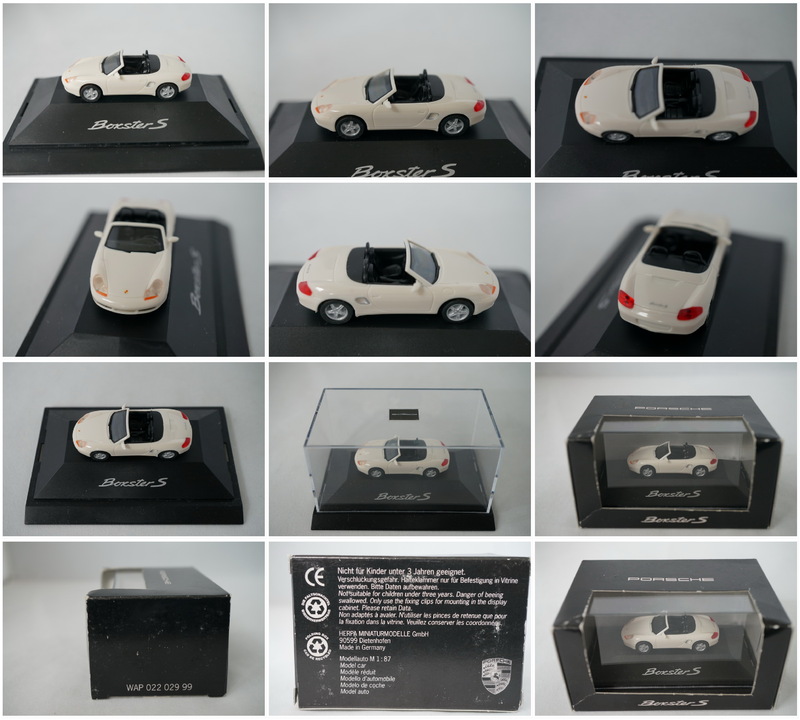 Schuco Eifel Klassik 2003 set with Austin Healey, Porsche 911, Mercedes SL and BMW 2002. Ackerman no. 19243 Porsche 911 Police car (SDU cop). Plastic toy in approx 1/30 scale. Friction drive.Maisto Porsche 911 speedster. Issued by Shell (supercar collection) in the Netherlands in the 90's. Maisto Porsche 911 speedster. Issued by Shell (supercar collection) in the Netherlands in the 90's. Avon 1968 Porsche 911. Apres-rasage everest after shave 50ml. 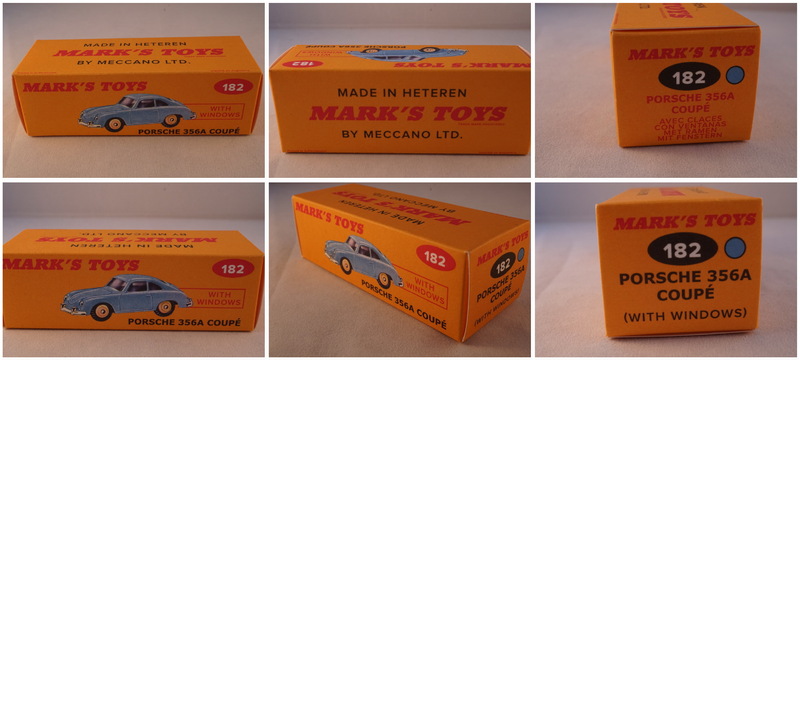 Cars (by Disney) Porsche 911 "Sally" Approx 1/57 scale. Please note; there is a flaw in the paint on the lefthand site. Revell 8703 Metal kit Porsche 959B Canon. Scale 1/24. Complete with racing decals. Opening doors, hood & bonnet. Burago 3021 Porsche 356B Cabriolet 1961. Schuco 4 car Porsche set in 1/87 scale; diecast. Porsche 356 No. 1 - Porsche 550 Spyder - Porsche 904 - Porsche 356 Coupe. Dinky Collection DY-902 Classic Sports Cars series I. Porsche 356A coupe 1958 - Mercedes Benz 300SL Gullwing 1955 - Ferrari Dino 246GTS 1973 on wooden plinth. MIB ; some minor wear to box. Hammer no 5 Porsche 356B. Special issue in copper colored body, black interior, wheels and dark frontscreen. Plastic, 1/57 scale. Hammer no 5 Porsche 356B. Blue body, white interior with grey wheels. Plastic, 1/57 scale. MIB blisterbox Box shows some minor rubbing wear. Crio (French washing powder) Porsche Spyder (blue). Copyright © 1998-2019 ETNL-Diecast models. All Rights Reserved.